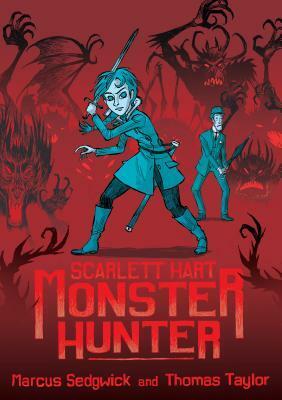 Scarlett Hart is the orphaned daughter of two famous monster hunters. The Royal Academy for the Pursuit and Eradication of Zoological Eccentricities (TRAPEZE) feels she's too young to follow in her parents' footsteps, but she is determined to do it anyway. This graphic novel has darker colors, possibly because of its noirish theme. With her reddish hair and the "Leaping Lizards!" when surprised, Scarlett makes me think a bit of Lil Orphan Annie, and what she would be like if she had a butler and gear to hunt down monsters. This is targeted toward the 10-14-year-old age bracket, which is probably why the plot is fairly straightforward. The art is a little on the simplistic side, especially when compared to other steampunk/ Victorian era graphic novels, but it's still engaging and easy to follow. The action sequences are more suggestive than detailed, but this is still a fairly engaging read.